Where do I use my Ligo voucher code? Communications is essential. To ensure that communication is constant, phones are still greatly utilized. Ligo electronics understands the need to maintain constant communications which are why they continue to provide great deals on phones, two-way radios, headsets, telephone systems, and even cameras. To save money on your electric goods such as corded and cordless phones, two-way radios and headsets with Ligo Electronics head to us at Netvouchercodes. 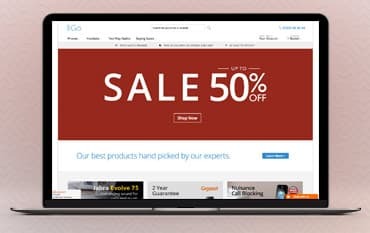 Ligo Electronics work directly with us to provide discounts and deals on many of their products with a selection of great discount codes, e-vouchers, promotions and more. We keep all our discount codes for each of our retailers in one easy space, so you can grab a code quickly and easily to ensure you save money as soon as possible. For easy and hassle-free savings simply check out our Ligo Electronics deals page above and find the perfect discount that suits your order. If you can't find a code or deal that suits you, don't worry new discount codes are added regularly so you are sure to grab some savings next time you buy. To stay in the loop and to never miss out on a bargain again, sign up to our newsletter for a first glimpse of new voucher codes and upcoming offers and receive email alerts when a discount code for Ligo Electronics comes along again. If you're looking for the perfect cordless phone (or phones) you’ll find a wide selection at Ligo Electronics. At Ligo, there's a huge array of digital cordless telephones ranging from budget value models (under £30 for single DECT phone) to highly resilient robust models through to top-range DECT phones from BT, Gigaset, and Panasonic with Touchscreens, Bluetooth, Wi-Fi and more. Phones are available in Single, Twin, Trio and Quad sets. You’ll also find all the latest DECT Accessories such as Long Range Repeaters to boost the signal of your cordless phones for extra coverage; GAP Compatible Wireless Headsets, Corded Headsets, and Bluetooth Headsets for convenient conversations in hands-free. You can even connect your mobile to your landline phone with our very own liGo Bluewave. You can find tonnes of deals at Ligo Electronics on products like cordless and corded phones, two-way radios and headsets. All the deals available can be found on the Ligo website and here at Netvouchercodes so you can grab quick and easy savings on all your electronics when you buy online. We offer a free Uk standard delivery service for all orders over £50. For orders under this amount the cost is £4.99 and takes 3-5 working days. If you want your order quickly you can opt for our express delivery service, which will get your order to you within 1-2 working days. If you want to return all or part of your order then please contact us via the online form or call us on 03333 448044. We will set up a retrns authorisation number and provide you with instructions for return. Ligo is committed to delivering the lowest prices to each of their customers which is why they provide tonnes of discounts, deals and voucher codes on all their electrical products through us here at Netvouchercodes. Discover cordless and corded phones, headsets and two-way radios at Ligo Electronics Ltd from huge names in the electronic industry such as BT and Panasonic. And remember, before you buy, make sure you head to us here at Netvouchercodes for a huge saving on your order.